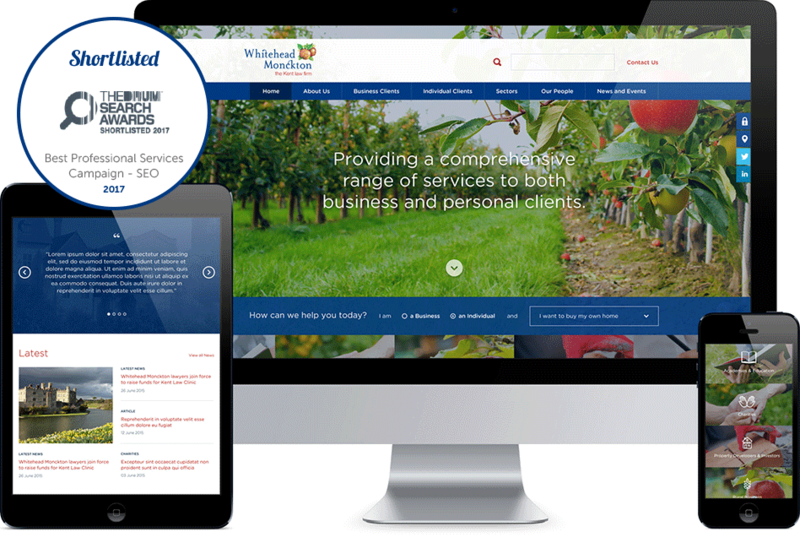 Whitehead Monckton is a full-service law firm based in Kent which has been working with Reflect Digital for the last 5 years. The firm is now the most dominate law firm in Kent from an SEO perspective as a result of the latest campaign. The performance of this combined UX, website development, SEO and content marketing strategy was recognised when the campaign was nominated for the Best Professional Services SEO campaign at the Drum Search Awards. As a result of previous SEO work Whitehead Monckton already had a strong organic presence in the search engines. Due to budget restrictions, increasing search traffic through paid search was not an option so we needed to maximise conversions from existing traffic and continue to increase their search engine visibility to ensure Whitehead Monckton are seen as the number 1 law firm in Kent. We made the decision to remove a lot of old content that may have been driving traffic but the traffic was not engaging with the firm and not providing value. Removing content from a website is always a concern as it is highly likely to result in a traffic drop so we needed to ensure existing content was improved and also similar content was combined in order to drive more relevant traffic and reduce the risk of keyword cannibalisation. With the majority of potential clients searching locally for a law firm is was vital local SEO was dominated through strong on-page signals as well as the optimisation of Google My Business listings to continually have maximum local 3 pack visibility. Good SEO starts with a solid foundation of technical and general best practice SEO. Good crawl health has been maintained, with on-page optimisation, solid internal linking structure, descriptive URLs, optimal redirection practices and various page speed techniques being implemented. Along with other aspects of technical SEO including pagination markup, schema markup, social metadata and canonicalisation. in order to maximise the conversion rate and attract relevant visits, links are obviously important so we also implemented various content marketing strategies including promotion of useful advice infographic content about Wills as well as “do’s and don’t of separation”, guest post outreach and local press PR over the 12 month period. All content activity was focused around providing value to the intended audience. 255 non-brand keywords ranking on the first page with 81 in first position. We have designed various infographics which have been hosted on the Whitehead Monckton website, a perfect way to break down lengthy content into a more digestible format. In addition, Whitehead Monckton benefits from any 'link juice' passed on from other related high authority domains linking to this content. They also tasked us to create a pop-up stand design that would portray their excellent value ethos and their 230 years of expertise in providing legal services to businesses and individuals in Kent.